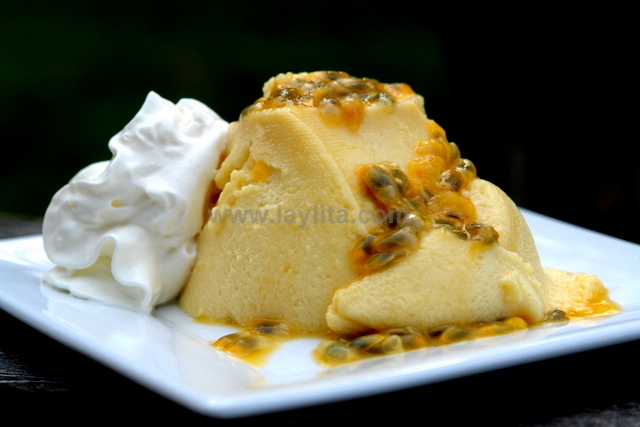 Mousse de maracuya or passion fruit mousse is a delicious and easy to make dessert. 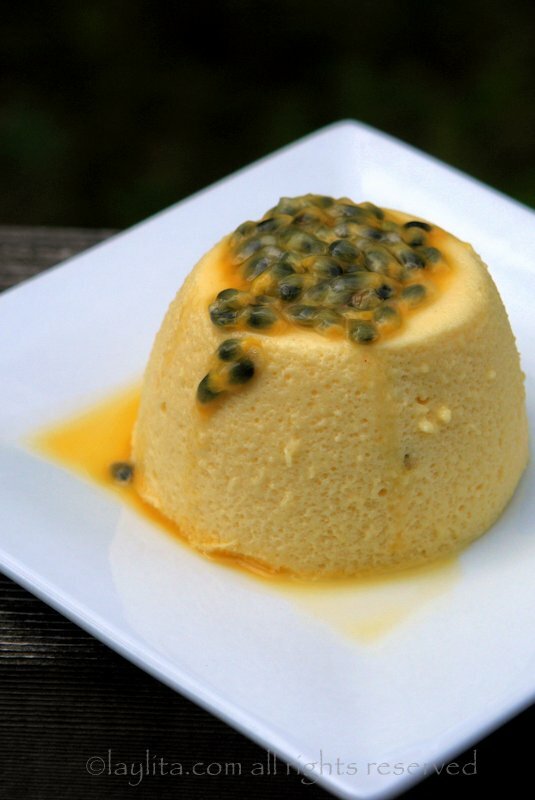 This tropical mousse is made with passion fruit pulp, whipping cream or condensed milk, egg whites and sugar. 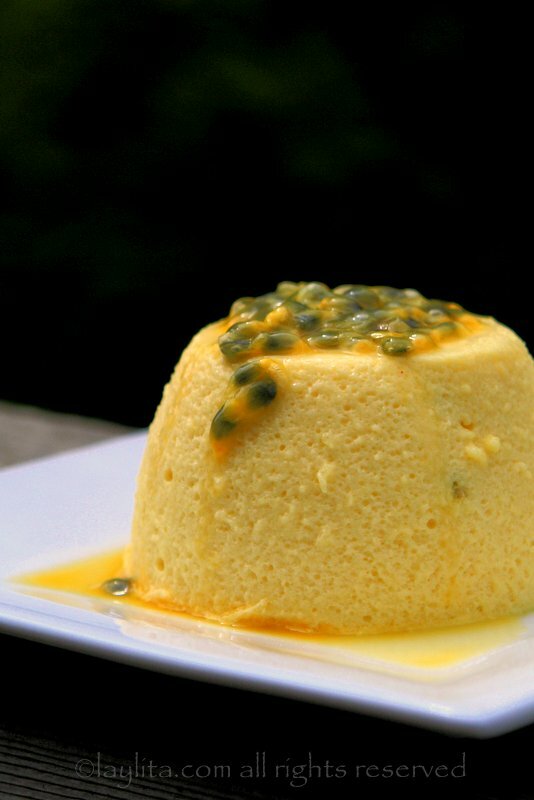 This South American dessert is very popular with my friends who have tried it. 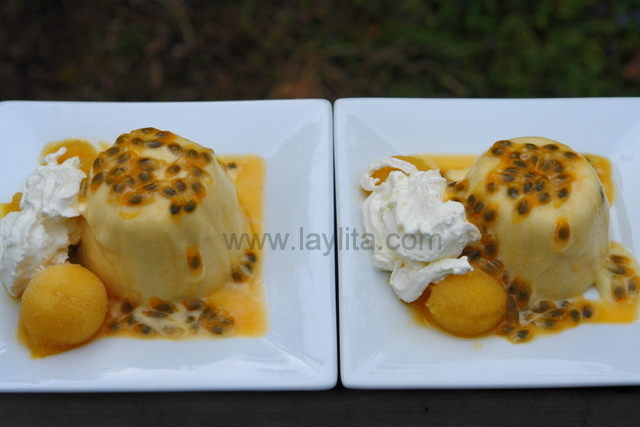 The first time I made was when one of my friends requested that I make it for dessert, she had tried passion fruit mousse in Brazil and loved it. The easiest way and most typical way to make this dessert (and many others in South America) is to use condensed milk. 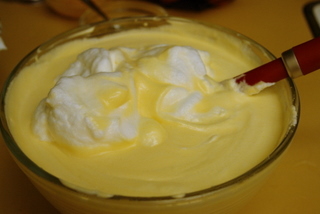 I used condensed milk that first time and was not too crazy about, however when I added a spoonful of fresh passion fruit pulp on top of the mousse and some whipped cream on the side the taste improved dramatically. 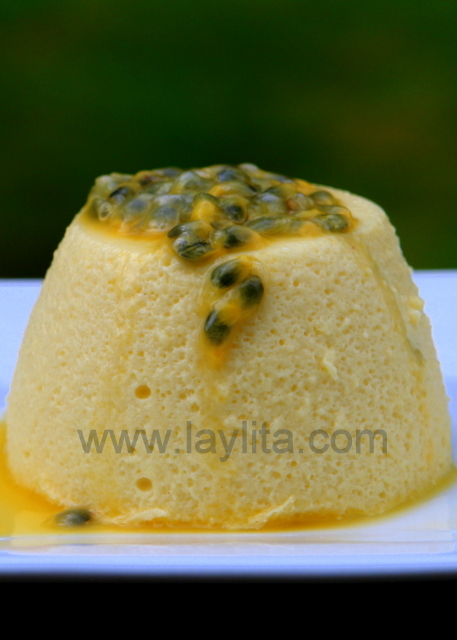 Recipe for mousse de maracuya or passion fruit mousse, a delicious and easy to make South American dessert. 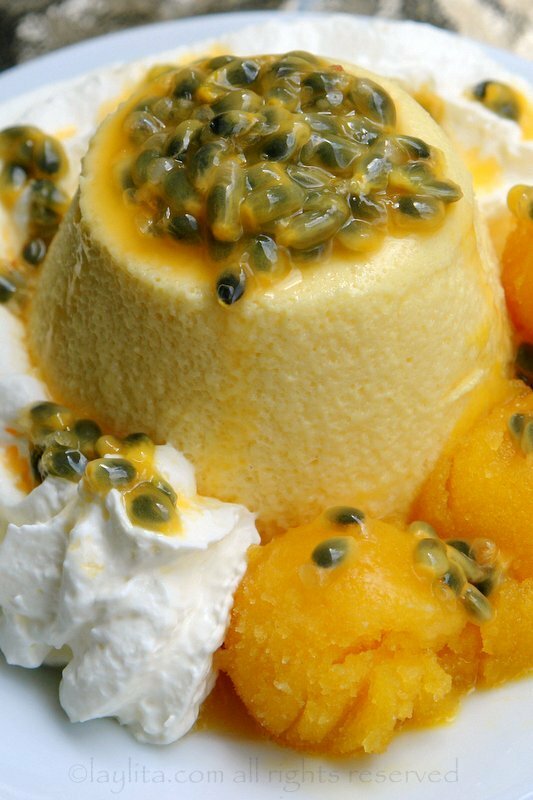 This tropical mousse is made with passion fruit pulp, whipping cream or condensed milk, egg whites and sugar. 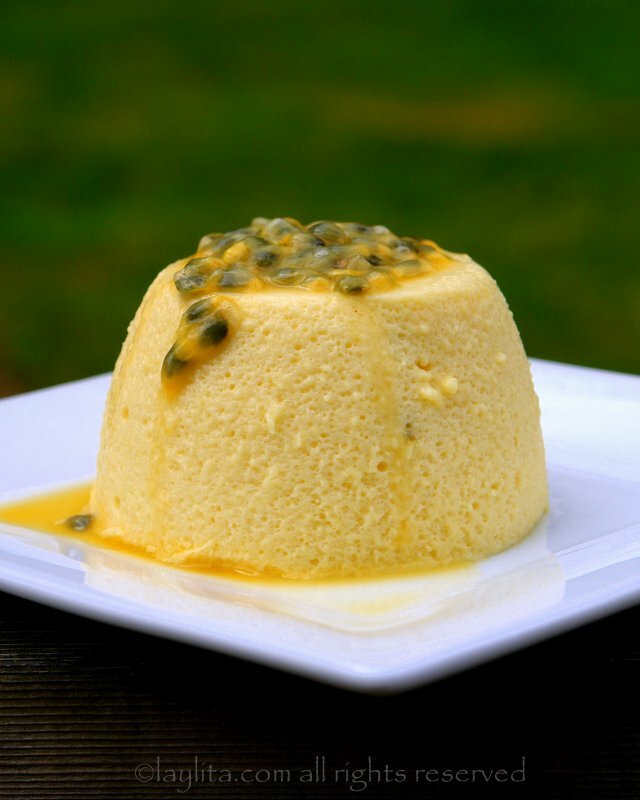 Combine the passion fruit juice, sugar (use only 1 cup of sugar if using condensed milk instead of cream or 1 ½ cup if using half condensed milk and half cream), and lime juice in a sauce pan and heat until the sugar dissolves, remove and let it cool down completely. 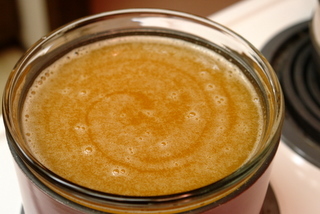 Sprinkle the unsweetened gelatin over ¼ cup water in glass heatproof bowl, let soften for about 5 minutes. 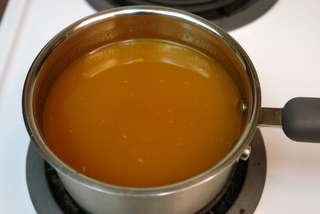 Place the heatproof bowl over a simmering pot of water and stir until it dissolves, then stir in the passion fruit juice. 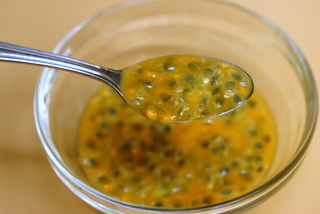 Place the passion fruit and gelatin mixture in a bowl of cold water and let it cool down for 30 minutes, stirring occasionally. 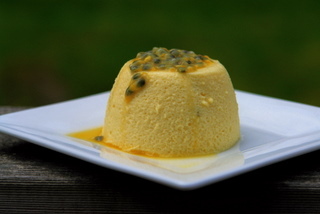 Use an electric mixer to whip the cream until peaks form, and then use a spoon to mix in the passion fruit juice mixture – (if using condensed milk just mix it with the passion fruit juice or if using half condensed milk and half cream then whip the cream and then stir in the passion fruit juice and condensed milk). 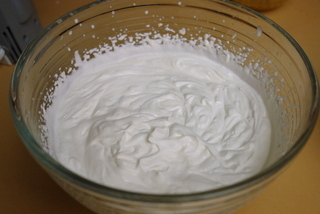 Combine the egg whites and tartar cream in a large whipping bowl and mix until stiff peaks form. 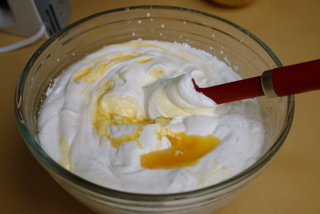 Whisk 1/3 of the egg whites with the passion fruit and whipped cream mix. Next use a spatula to gently fold in the remaining stiff egg whites. Gently mix in the fresh passion fruit pulp and seeds if using. Place the mousse in a large dessert mold or small individual ones, cover and refrigerate for 6-8 hours, overnight is ideal. To remove the mousse from the small molds place them in a bowl with room temperature water before serving to loosen them, then slide a knife along the edges of the mold to help release the individual mousses. Serve with a spoon of fresh passion fruit pulp on top, other optional garnishes include whipped cream and/or passion fruit sorbet. The combination of the freshly whipped cream and the mousse reminded of these amazing passion fruit and cream popsicles that I used to eat in Ecuador, and that was exactly the flavor that I wanted to obtain in the passion fruit mousse. The second attempt was much more successful: I eliminated the condensed milk and replaced it with heavy whipping cream. 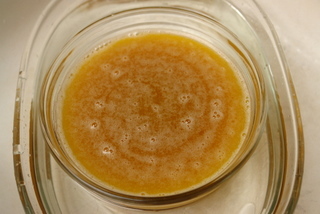 I also added some fresh passion fruit pulp into the mix; it worked out very well. Now, it is a question of preferences, I have a lot of friends who are crazy about condensed milk and they might have preferred the taste of the mousse with condensed milk. 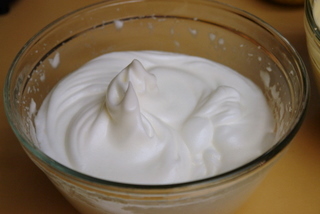 You can also use a mix of half condensed milk/half whipping cream if you want the best of both worlds. Another reason that I prefer using whipping cream is that it made the texture of the mousse a lot more fluffy and spongy. In Ecuador (and many places in Latin America) maracuyas or passion fruits grow like weeds. Seriously in the town where my parents live there are passion fruit vines everywhere; in addition if you go to the market or grocery store you can buy several huge passion fruits for less than $1. Here in the US it’s the opposite: it’s almost impossible to find passion fruits anywhere and when you are lucky enough to find them they are tiny and cost $3-$5 per fruit. However, most Latin grocery stores will carry frozen and unsweetened passion fruit concentrate or pulp, which is what I use most of the time that make anything that calls for passion fruit. Yes, there is no comparison the taste of using fresh fruit, but it still works well. For this passion fruit mousse I used the concentrate to make the mousse and then used fresh passion fruits that I found at Uwajimaya (a local Asian grocery store, which also sells plantains, yuca starch, and many other ingredients used in Latin American dishes) to garnish the mousses. I also added some fresh passion fruit pulp in the mousse mixture to give it extra flavor; however it will be fine if you just use the fresh fruit pulp to top off each serving. You can either just put the entire passion fruit mousse mix into a large dessert bowl and keep it simple, or be very creative about serving and presenting them. 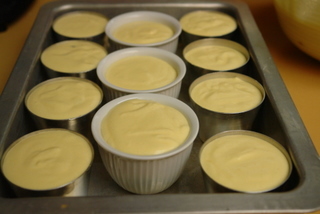 I used a combination of small dessert molds, ramekins, and mini-glasses. In addition to using the fresh fruit as a garnish, I also served each mousse with some extra whipped cream and some passion fruit sorbet, this last one was just an extra that I happened to have leftover from a different occasion, but it really added a nice touch to the mousse. The quantities in this recipe are for about 15-20 small servings. Excellent recipe! I remember ordering this at a Mediterranean deli and have always wanted to make this. 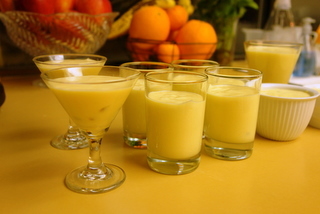 I used fat-free condensed milk and passion fruit juice/concentrate. I also found a recipe where I could make a thin layer of gelatin on top of the mousse with the left over juice. It came out very well. All of my co-workers loved it. 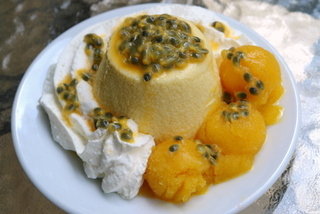 Please , do you have passion fruit recipes? I love all your recipes and constantly “Pin” them on Pinterest. Thank you for sharing. I made this recipe for my husband’s birthday but used sugar instead of condensed milk. Also I added a white chocolate mousse on top and made a base of almond cookie similar to a cheesecake base. It was impressive and people were raving about the taste. Thank you so much Laylita, not only this recipe is easy to make but it works with the frozen pulp that you find in the USA. Your recipes are so professional and trustworthy. Keep up the excellent job! I’m going to use this for my spanish class project! Thank you for having these recipes up!!! This looks delicious and I hope I can find a cultural background on it. I’ve been to Ecuador recently for my job and fell in love with the country, the people and the food. Your website takes me back both with stories and pictures and in taste (food I can try at home). Muchas Gracias! 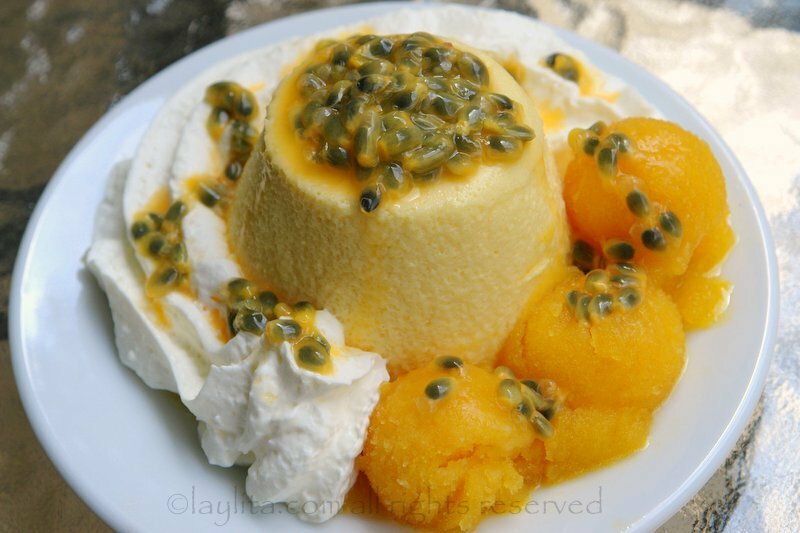 Oh my gosh, I loooove passion fruit and this looks absolutely amazing! I guess I need to begin my search for passion fruit. I like that there are Californians who have found it out here… gonna take their suggestions and begin my search! Amazing recipe and pictures! My husband lived in Brazil for two years and always talks about this dessert. I’m soooooooo thrilled to have found your site. Thank you! The best Passion Fruit Mousse I’ve ever tried! ay dios mio – i have dreams of maracuya here in the states! = definitely one of the highlights of my few months in ecuador. even just a smidge north (costa rica, panama), the maracuya is seriously lacking. some of my favorite memories include climbing over and under fences to snag a few maracuya off the local plantations. and it’s also great in mixed drinks! i love your blog; it keeps me reminiscing until i can plan my next trip. and since plantains are pretty prolific in CA, and i’m always cooking with them, i’m looking forward to trying out your recipes. thanks so much! I think this recipe looks AMAZING! I can’t wait to try it! I just have one question: the recipe says “2 envelopes unsweetened gelatin”. I’ve seen unsweetened gelatin in many sizes… I already had this problem with a cheese cake recipe and it was too hard because of the gelatin. Could you tell me how much weight those envelopes? I would truly appreciate it. Oh, by the way, I saw the yellow passion fruits in Venezuela and they do get all wrinkly as the purple ones. Apparently world-wide the purple variety is more common but I think in South America the yellow ones are more common. 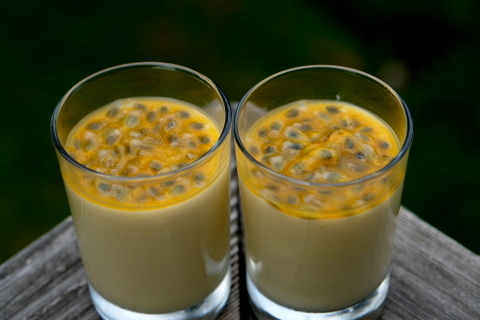 I have a different recepie for the passion fruit mosse.. I use cream chesse condense milk and heavy cream intead of the eggs whites.. nevertheless I will try this recepie.. it lighter.. in sugar.. and everybody loves it..!! My great aunt used to make this and your recipe tastes the same as I remember from my childhood. No one had this recipe in the family and she passed many years ago. Thank you. 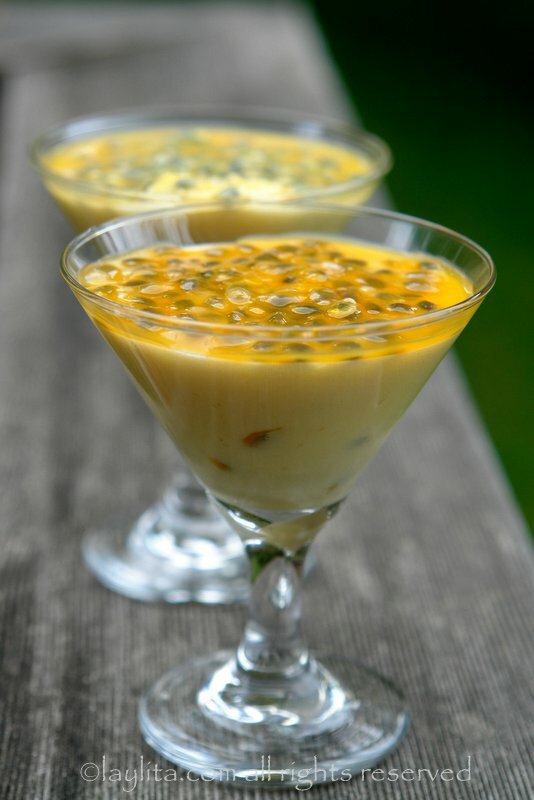 oh i love maracuya, my favourite fruit next to guayabas and mango – i have tried a passion fruit panna cotta, not too successfully, my passion fruit creme brulee is getting better… but this looks absolutely amazing – will try it as soon as i am settled in my new home! Looks amazing. I love passionfruit and found a great little stall at the local farmers market with really reasonable fruits. 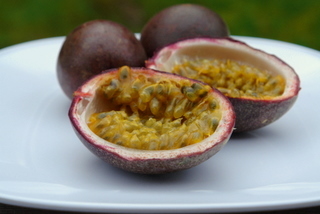 Hey everybody – you can grow your own passion fruit in California. I live in Berkeley, nice weather but not the most tropical. I grew up in Africa where we grew up on “granadillas” small v. wrinkled brownish/purple balls which you open up – and behold the passion fruit. When I came to live here I started planting my old faves – avocadoes, citrus. Then I saw in our local “Osh” store passion fruit vines. I did a little research on line and found that some of them do produce fruit – mostly the banana fruit kind – sort of looks like testicles growing on a vine, green until they turn yellow when they are ripe. So I have grown my own, and right now I’m harvesting and trying out this new recipe. Last year I improvised with orange gelatin and cream and it turned out delicious and v. delicate in color. Then I picked a flower off the one vine to docorate – it is the most beautiful deep rasberry color flower. The vines growrapidly and are v. beautiful – I have 4 different kinds each with distinctive color and shaped flowers. I’m in California and I’ve seen passion fruit at the local Safeway. There’s usually only a few of them, but they’re usually always there. 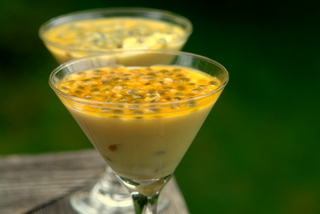 I fell in love with passion fruit mousse on a trip to Brazil some years ago and had three helpings at a friends house one evening! Passion fruit whole, pulp and juice is readily available here in the UK – I’ll be making some from this recipe next week. Lovely! Yum, thank you for posting this! I ate this at a restaurant called hasta la vuelta senor in quito and fell in love with it. 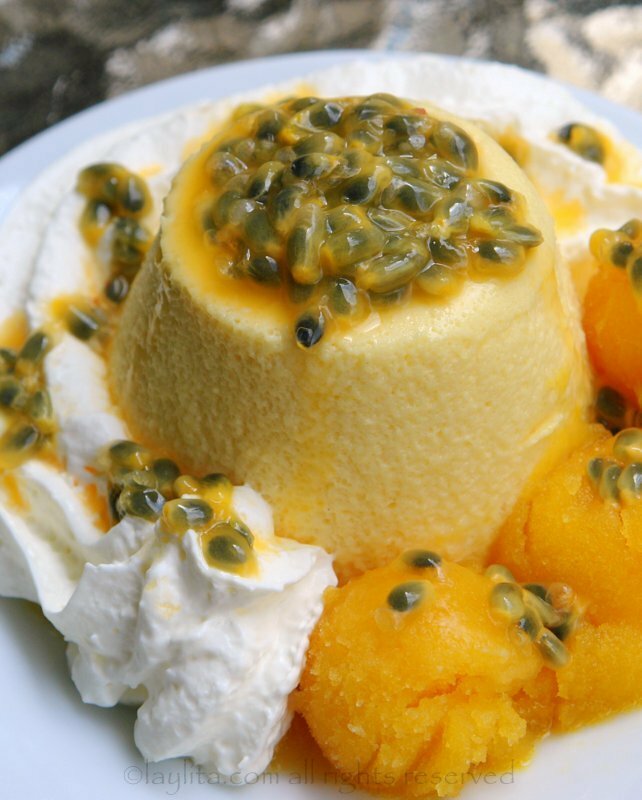 I want to make it but since I live in Ecuador and have plenty of fresh passion fruit on hand, how do I use the fresh pulp? Is it the same measurement of 1 1/2 cups? I am assuming I have to blend the pulp and then strain the seeds to use it. Am I right? Hi Kathleen – Lucky you! 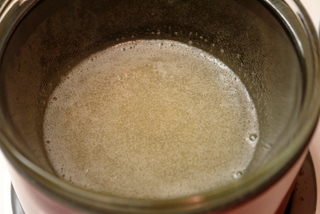 You are right, just blend the pulp and strain the seeds, and use 1 1/2 cups of the strained juice. These are as good as chocolate mousses, but fruity flavor! Yum. Leeh, it must be around somewhere, as my college in Sacramento had passionfruit icees that tasted almost exactly like the juice in Ecuador. In the meantime there are passion fruit concentrates and syrups available in Amazon’s Gourmet Foods section; the concentrate is pricey, though. Laylita, a question: here in Colombia and Ecuador (family originally from Conocoto), the maracuya is yellow. The only fruits I’ve seen in the States have purple skin. Do you know why this is? It’s been bothering me for years. Gabriela – I believe that the purple varierty (which I have seen in Ecuador though it isn’t as common as the yellow ones) is found here because it is imported from New Zealand or other APAC regions. Another observation is that the purple ones seem to last longer – in Ecuador we usually use the yellow ones very quickly and I haven’t seen the yellow ones get all wrinkly the way the purple ones do, so maybe the purple variety is a more hardy variety that grows better in other regions and also has a longer shelf life than the yellow ones (making it a better investment for the growers). Just my theory. Leeh – I’ve also seen an Ecuadorian company that sells the frozen pulp online, I haven’t ordered any of their products so I don’t know about the quality of the product. Also, I just saw fresh passion fruits at Whole Foods yesterday (but it does seem to be seasonal and varies from one location to another – and I haven’t tried this but supposedly you can ask the produce manager to order them). I’ve had a lot more success with Asian grocery stores for passion fruits. In california you may be able to find the passion fruit canned in the latin american markets…. This looks amazing. I would like to make it but we don’t have a passion fruit here in California. Wow! I’d love to taste this! Sounds and looks so good. Fantastic! That is one of my favorite fruits!